The Video Consultation web based software can easily be used with Moodle sites to build live video interactive virtual learning management systems . 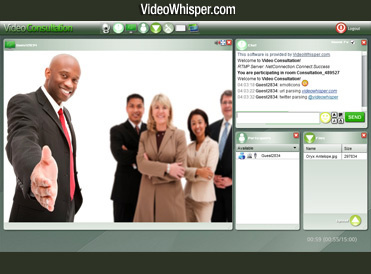 Video Consultation is a video communication web application designed for online video consultations, interactive live presentations, trainings, webinars, coaching and online collaboration. Moodle is a Course Management System (CMS), also known as a Learning Management System (LMS) or a Virtual Learning Environment (VLE). It is a free, open source web application that educators can use to create effective online learning sites. This Video Consultation edition integrates into Moodle as an activity module so video consultation seminars can be added to courses as activities. We recommend using this with latest Moodle version. Was tested with Moodle 2.0.1+. All module php integration code is provided with full source code under GPL (free to use and edit). You will find multiple details about Moodle Video Consultation module activity on this page: demo, how to install, how to configure, how to use, activity settings and permissions, how to customize, how to uninstall/upgrade, all plugins for Moodle. See this module in action on the Videoeminar - Video Seminars website. Create a free account . Select a course and enrol from SETTINGS > Course Administration > Enrol me in this course. Access the Video Seminar activity for that course. The test site includes a Teacher Demo and a Student Demo that demonstrate default permissions for teachers and students. If you have an account you can enrol directly with these links. Download the zip file and unzip it to your moodle/mod directory. To verify everything is in the right location, see if you have mod/videoconsultation/README.txt . Moodle 3.0 requires $module replaced with $plugin (ex. $plugin->version) in version.php from module folder, to allow installation. Older Moodle works with $module (ex. $module->version). Access from menu: Site Administration > Plugins > Activity modules > Manage activities (or Administration > Modules > Activities in versions of Moodle prior to 1.9). Click on delete next to the module you wish to remove. Use a file manager to remove/delete the actual module directory from moodle/mod, otherwise Moodle will reinstall it next time you access the site administration. If you wish to upgrade, after removal just follow installation instructions to install the new version. The Moodle integration is based on a slightly modified php video consultation edition so you can also check that for customizing settings, integration and implementation of other features.